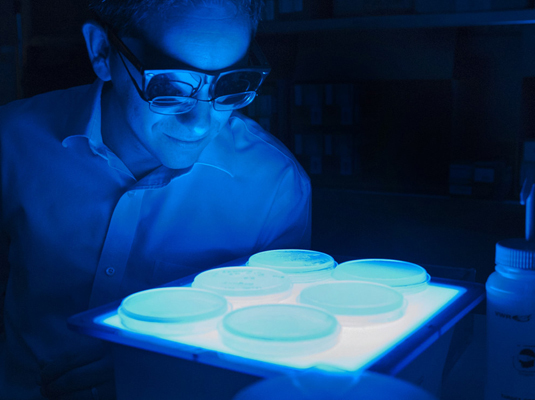 We engineer bacteria, yeast, and algae to add new metabolic and sensing capabilities. Our software has designed over 100,000 synthetic DNA sequences for biotech researchers around the world. An organism's genes control its cellular fate: metabolism, self-replication, development, pathogenesis, and disease. Gene expression levels are controlled by multiple layers of biomolecular interactions with its genetic template. With so many coupled interactions, it remains a challenge to predict how DNA mutations affect gene expression levels. In the Salis Lab, we develop and experimentally validate biophysical models that predict an organism's gene expression levels from its DNA sequence. Each model is highly reductionist, focusing on specific biomolecular interactions that control transcription rate, translation rate, or their regulation. We formulate low-parameter models using statistical thermodynamics and kinetics, parameterize them using rationally designed series of experiments, and validate their predictions across hundreds of experiments using diverse DNA sequence sets. 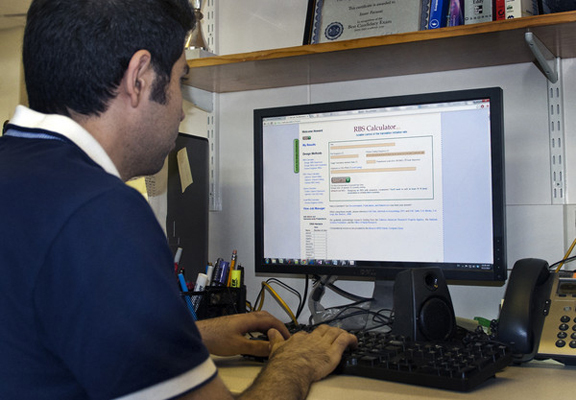 We then create user-friendly web interfaces so that the Life Science community can use our biophysical models of gene expression for their own studies. The functions of simple micro-organisms are ultimately determined by their DNA sequences. By redesigning those sequences, we can engineer micro-organisms to become distributed sensor networks, active signal processing agents, chemically computing decision-makers, and nano-sized chemical factories. In practice, there are an astronomical number of design choices (different DNA sequences), but only a relatively few will yield a successfully engineered micro-organism. 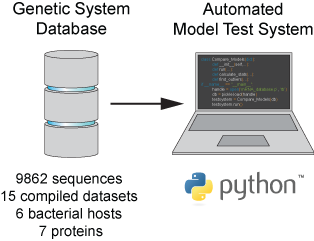 In the Salis Lab, we develop computational algorithms that allow researchers to rationally design and efficiently optimize the DNA sequences of engineered micro-organisms. Our algorithms design very specific DNA sequences that yield well-predicted gene expression levels inside the cell, enabling researchers to combine and control multiple genes together in a reliable fashion. We use our algorithms to increase recombinant protein expression, design sensors for diverse chemicals, efficiently optimize metabolic pathways, and program sophisticated decision-making genetic circuits. "Engineering Super Microbes to Save Us"
Prof. Salis connects our everyday consumerism to the global energy and chemicals industry. What will it take to build a prosperous biorenewable chemicals industry, ridding our society of its dependence on petroleum? Can Super Microbes Save Us? A public lecture in the seminar series "Strategies for Survival on Planet Earth", hosted by Penn State University's College of Eberly Sciences. 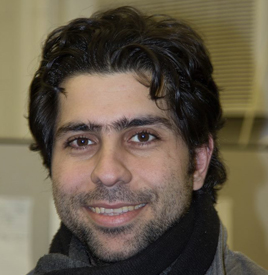 Prof. Salis describes the recent applications of his lab's research in a globally tele-cast webinar entitled "Clone Less, Know More: Efficient Expression Optimization of Proteins and Pathways", hosted by GenScript USA. This webinar covers the computational design of synthetic DNA to systematically optimize expression levels in one- or multi-protein genetic systems, while performing the fewest number of experimental measurements. Because it's costly and honestly quite boring to screen combinatorial libraries. So let's use our brains instead! Micro-organisms can be engineered to detect and respond to specific chemicals with applications in medical diagnostics, CBE detection, and environmental remediation. Using a biophysical model of riboswitches (RNA-based sensors), we have rationally designed and engineered cell sensors for drugs, metabolites, toxins, explosives, hormones, and neurotransmitters. 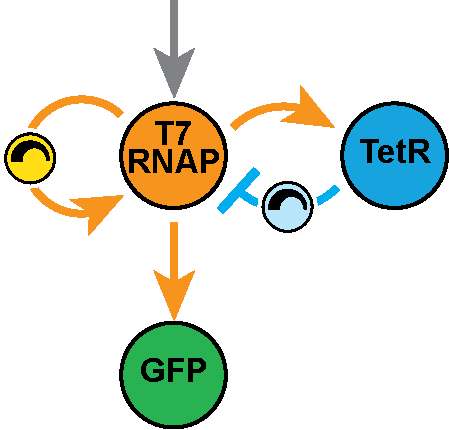 We have also engineered natural sensors that employ transcriptional regulation to sense important chemicals. Genetic circuits combine multiple gene regulators to perform signal processing and decision-making. We use our biophysical models to rationally engineer synthetic genetic circuits with desired input-output transformations. We have created a series of signal amplification circuits to enhance the dynamic ranges of our cellular sensors. 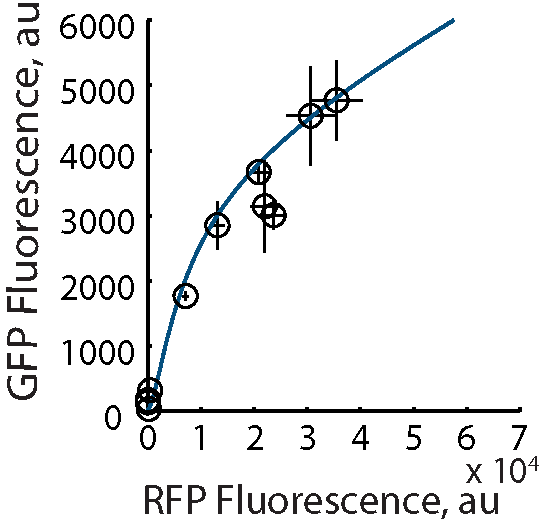 We have also developed new approaches to experimentally measure the intrinsic binding affinities of transcription factors, which becomes necessary to predict, control, and optimize their gene regulatory behaviors. We rationally engineer and introduce new metabolic pathways into organisms and efficiently optimize their biosynthetic capacities. We have engineered a 3-enzyme terpenoid biosynthesis pathway to demonstrate our new approach to pathway optimization; a 5-enzyme Entner-Doudoroff pathway to rapidly regenerate the essential cofactor NADPH; and a 6-enzyme furfural catabolic pathway to remove a toxic microbial inhibitor found in lignocellulosic feedstock. Our design algorithms allow new researchers to quickly design, build, and optimize metabolic pathways with a high rate of success. As our engineered genetic systems have grown in size, we now routinely integrate them into the organism's genome to ensure their stability and self-replication. We've combined our rational design methods with the latest genome engineering techniques -- MAGE and CRISPR/Cas9 -- to snip, slice, and prune an organism's genome with desired knock-up and knock-down of its gene expression levels. Say goodbye to plasmids! 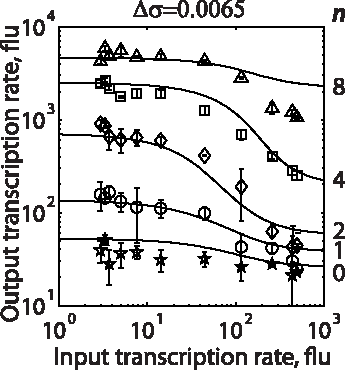 Predicts the translation initiation rates of natural bacterial mRNA sequences (validated in many bacterial hosts). Designs synthetic ribosome binding sites for targeted translation initiation rates. Designs the smallest size library of ribosome binding sites to uniformly vary a bacterial protein's expression level. Designs maximally informative genetic system variants for efficiently finding a system's optimal protein expression levels. Predicts the expression levels of proteins within a multi-cistronic operon (translation rates, translational coupling rates, and mRNA stability changes). Designs the mRNA sequence of a multi-cistronic operon for maximal expression control over its proteins. 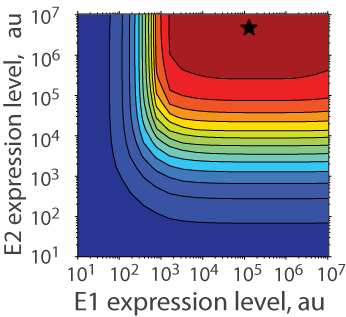 Predicts changes in expression from translation-regulating riboswitches in bacteria. Designs synthetic riboswitches that bind to specific chemicals with the highest possible expression level change. 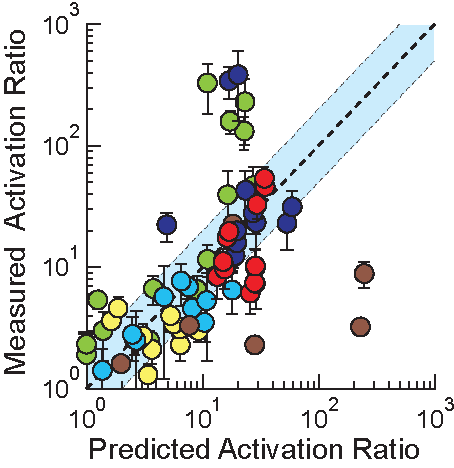 Predicts changes in expression from translation-regulating regulatory RNAs in bacteria. Maps the relationship between DNA sequence, enzyme expression level, and pathway productivity for a multi-enzyme metabolic pathway, while using the smallest number of characterization experiments. Predicts the optimal enzyme expression levels of a multi-enzyme pathway, using a sequence-expression-activity map (SEA MAP). 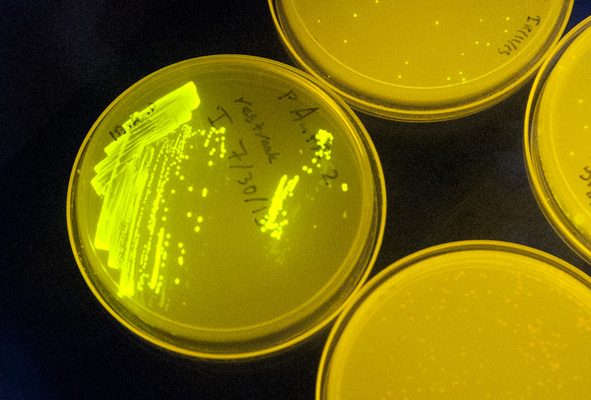 Synthetic Biology has a Scaling Problem. When we engineer an organism, there are an astronomical number of design choices (different DNA sequences), but only a tiny fraction will produce a high-performance, economically viable organism. Modern Synthetic Biology requires model-based predictions and sophisticated computational design methodologies to build only the most optimal designs. The Salis Lab is at the fore-front, building a modern Synthetic Biology engineering discipline that expands the breadth of applications and eliminates trial-and-error. Who Uses Our Models and Algorithms? 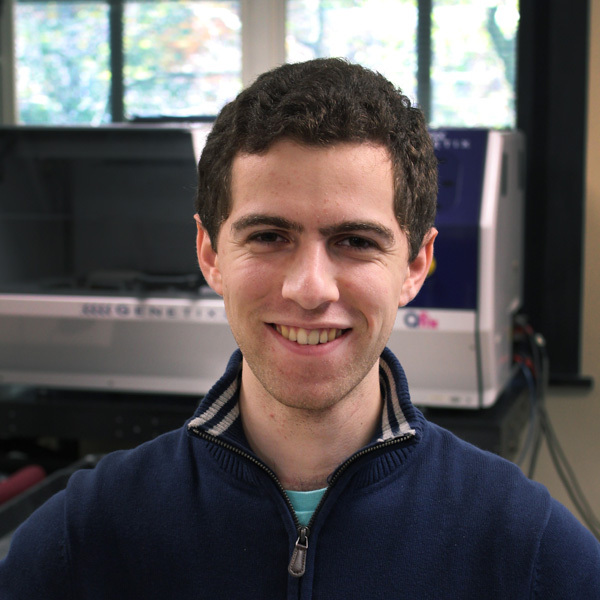 Alex is developing advanced sequence-to-function biophysical models of gene expression and regulation for prokayotes and eukaryotes. His hobbies include rowing, weight lifting, reading, creative projects, and PC building. 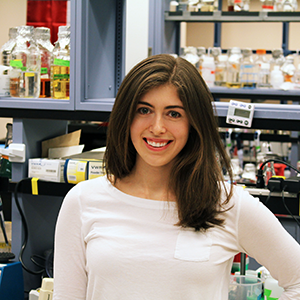 Grace is engineering RNA-based sensors for applications in metabolic engineering, toxicology, medical diagnostics, and environmental remediation. In her free time, she enjoys hiking, skiing, and a good cup of coffee. 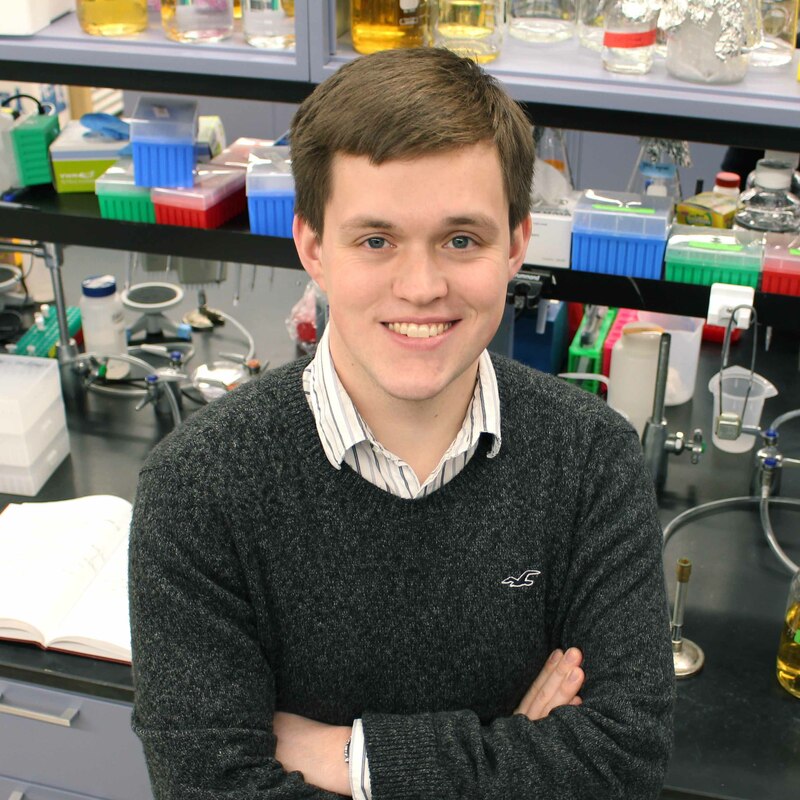 Sean is developing next-generation approaches to engineering synthetic metabolic pathways with many enzymes and synthetic genetic circuits with many regulators. In his spare time, Sean enjoys tabletop games, videogames, and sleep. Daniel is developing experimentally validated design rules for large genetic systems, and applying them to re-engineer interesting gene clusters. 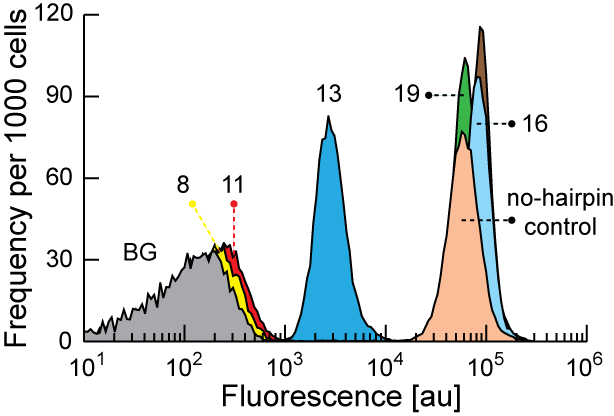 David is developing new time-resolved fluorescence spectroscopy approaches to characterize synthetic genetic systems at ultra-fast time-scales with applications to gene regulation, genetic circuit engineering, and genome editing. 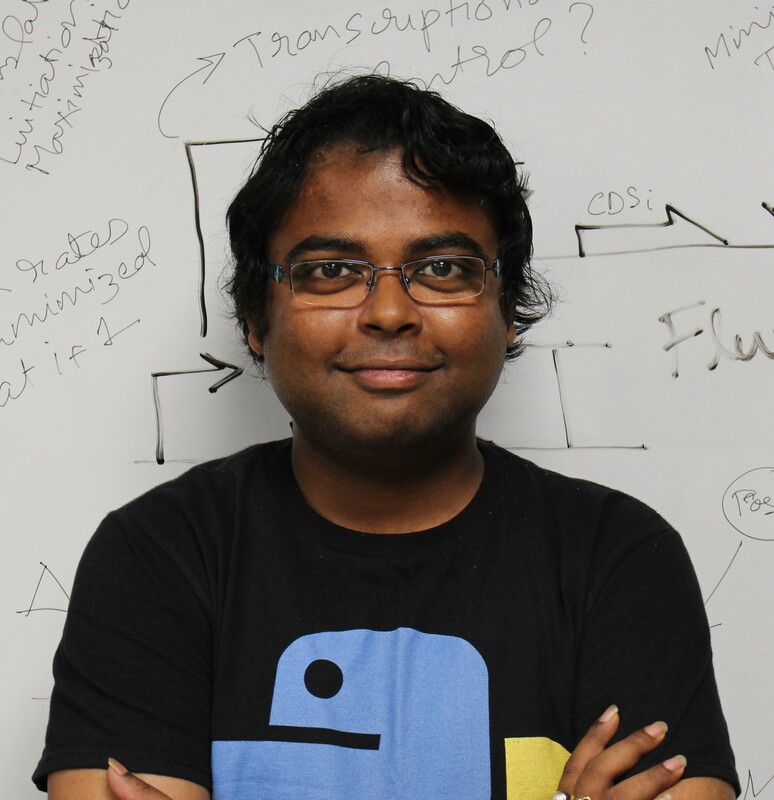 Ayaan develops and experimentally validates highly efficient (linear-time) optimization algorithms to engineer genetic parts, systems, and genomes with tailored design and synthesis constraints. In his free time, he enjoys watching SciFi. Aren't blue light trans-illuminators great? And your DNA is A-OK! Tian admires her stack of agar plates. Is this engineering or artistry? Or both! Iman designs a genetic system using our algorithms. 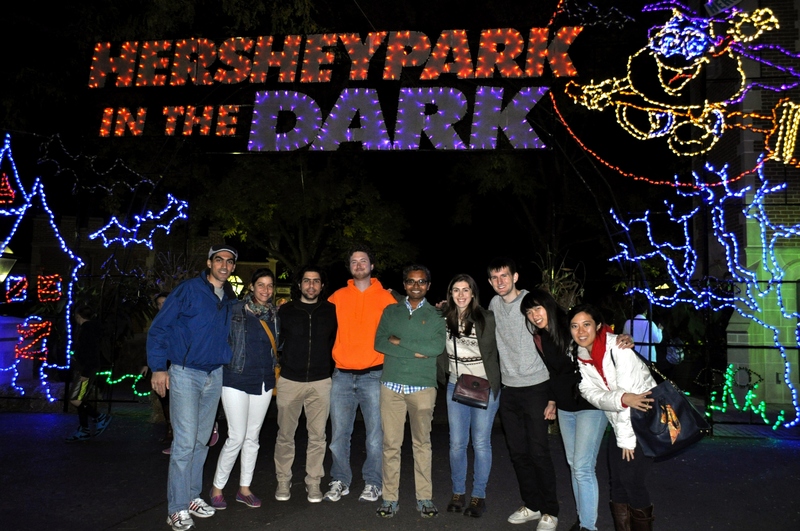 A Lab Outing to Hershey Park in the Dark. Halper S.M., D. Cetnar, and H.M. Salis. An Automated Pipeline for Engineering Many-Enzyme Pathways: Computational Sequence Design, Pathway Expression-Flux Mapping, and Scalable Pathway Optimization. Synthetic Metabolic Pathways within the book series Methods in Molecular Biology, v1671. 2017. Espah Borujeni A., D. Cetnar, I. Farasat, A. Smith, N. Lundgren and H.M. Salis. Precise Quantification of Translation Inhibition by mRNA structures that Overlap with the Ribosomal Footprint in N-terminal Coding Sequences. Nucleic Acids Research. 2017. Espah Borujeni A. and H.M. Salis. 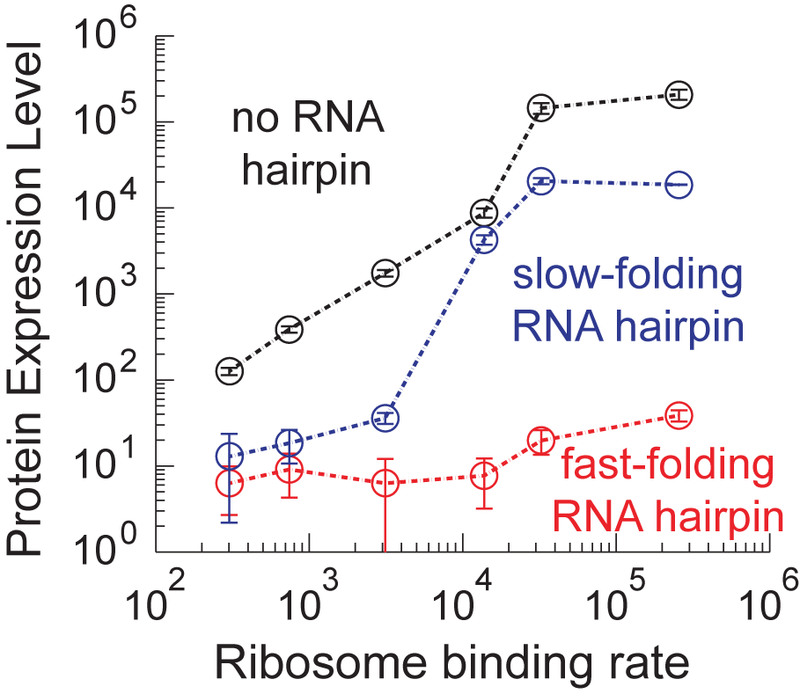 Translation Initiation is Controlled by RNA Folding Kinetics via a Ribosome Drafting Mechanism. Journal of the American Chemical Society. 2016. Salis, H.M. The Ribosome Binding Site Calculator, Methods in Enzymology. 2011. H. Salis, V. Sotiropoulos, and Y. Kaznessis. Multiscale Hy3S: Hybrid Stochastic Simulation for Supercomputers. BMC Bioinformatics. 2006. L. Tuttle, H. Salis, J. Tomshine, and Y. Kaznessis. Model-Driven Designs of an Oscillating Gene Network. Biophysical Journal. 2005. H.M. Salis. Simulation of Stochastic Chemical Systems: Applications in the Design and Construction of Synthetic Gene Networks, Ph.D. Thesis. Chemical Engineering, University of Minnesota. 2007. Howard presents the lab's unique blend of biophysical modeling and experimental synthetic biology at the University of Toronto's Connaught Summer Institute on Synthetic Biology. Howard presents the lab's new work on "Scalable System-wide Design of TF- and dCas9-Based Genetic Circuits" at SEED 2015 (SynBio Engineering Evolution Design), including the first dimensionless unit for engineering genetic circuits -- the Ptashne (Pt) number! Iman passes his Ph.D. Defense. Congratulations, Dr. Farasat! 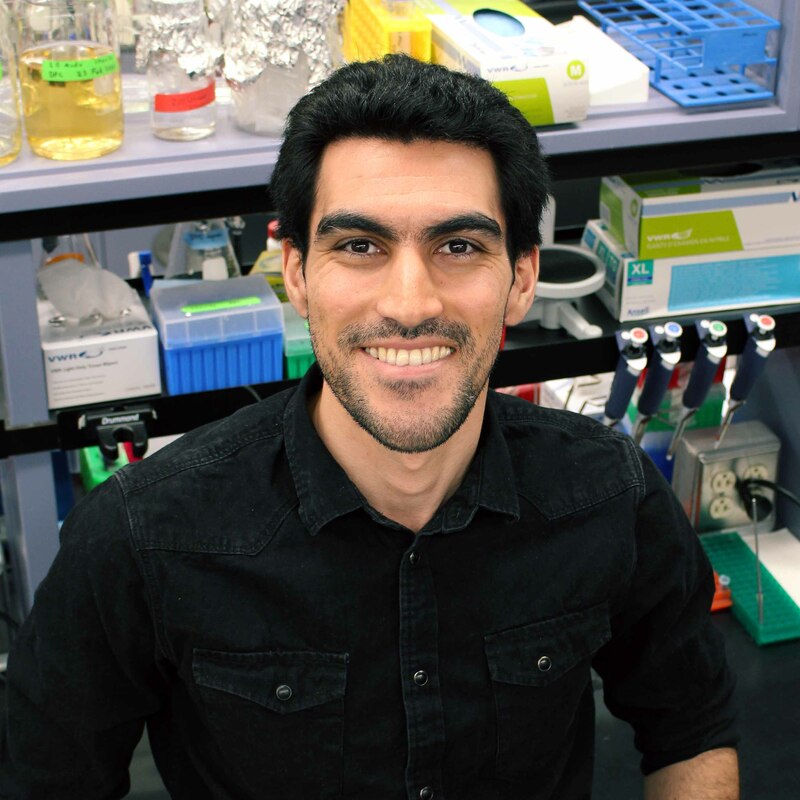 Iman Farasat successfully defends his thesis, entitled "Next-Generation Approaches for Efficient Optimization of Metabolic Pathways and Genetic Circuits", earning a Ph.D. in Chemical Engineering after years of hard work and grit. Congratulations to Dr. Farasat! Howard presents an overview of the lab's Synthetic Biology research during the Molecular Bioscience seminar series at University of Texas at Austin. Howard presents a webinar entitled "Clone Less, Know More: Efficient Expression Optimization of Proteins and Pathways", sponsored by GenScript. Telecast live and now available on YouTube. Howard provides a young faculty's perspective on the future of Synthetic Biology at a workshop "Engineering Biology for Science & Industry: Accelerating Progress", sponsored by the Sloan Foundation, in NYC. Amin Espah Borujeni presents his finished work on the "Automated Design of Synthetic Riboswitches from Diverse RNA Aptamers" at SynBERC's Spring Retreat in Berkeley. Howard presents the lab's recent work on "Automated Design of Synthetic Riboswitches from Diverse RNA Aptamers" at the International Conference on Biomolecular Engineering in Austin, TX. It was an excellent conference. Sean Halper and Alexander Reis join the Salis lab as first-year Chemical Engineering graduate students. Welcome! Tian Tian presents her recent research results at AIChE's Annual Meeting in Atlanta, GA, entitled "Autonomous Control of Metabolism with Synthetic Sensor-Circuits". ChiamYu Ng presents her recent research results at the AIChE's Annual Meeting in Atlanta, GA, entitled "Design & Optimization of a Synthetic Entner-Doudoroff Pathway for Efficient NADPH Regeneration". Howard travels to New Delhi, India to present the lab's unique, model-oriented approach to engineering synthetic organisms at the NSF-sponsored Indo-US Workshop for Systems and Synthetic Biology. Howard presents a seminar at Genomatica Inc.
Howard presents the lab's approach to efficiently engineering metabolic pathways at Genomatica's headquarters in San Diego, CA. Howard presents an overview of the lab's Synthetic Biology research during the Chemical Engineering seminar series at the California Institute of Technology. ChiamYu Ng wins the Best Presentation Award at the SynBERC Fall Retreat for her presentation on "Design and Optimization of a Synthetic Entner-Doudoroff Pathway for Improved and Controllable NADPH Regeneration". The Salis Lab moves to a new laboratory space in the Wartik building! Grace Vezeau joins the Salis lab as a first-year Biological Engineering graduate student. Welcome! Howard presents the lab's recent research results on "The Design and Optimization of a Synthetic Entner-Doudoroff Pathway for Efficient NADPH Regeneration" at the Society for Industrial Microbiology and Biotechnology's annual meeting in St. Louis, MO. Howard speaks at the Amazon AWS Government and Educational Symposium in D.C.
Howard shares the lab's experiences with translating research results into a user-friendly Software-as-a-Service using AWS' distributing computing system. A New Grant to Design Genetic Circuits! The Salis Lab receives a grant from the Air Force Office of Scientific Research to develop a theory-based genetic compiler that designs advanced synthetic genetic circuits. >Howard shares the lab's recent research on "White-Boxing Genetic Circuit Modeling: Absolute TF Binding Free Energies From Fluorescence Measurements" at the Quantitative-bio Winter conference in Kona Island, HI. >Amin Espah Borujeni presents his work on the "Riboswitch Calculator: De Novo Design of Synthetic Cis-Acting Riboswitches From Ligand-Binding Aptamers" at the AIChE Annual Meeting in San Francisco. Iman Farasat presents his work on "White-Boxing Genetic Circuit Modeling: Absolute TF Binding Free Energies From Fluorescence Measurements" at the AIChE Annual Meeting in San Francisco. Iman Farasat wins the Best Poster Award at the SynBERC Fall Retreat for his work on "Single-pass design of genetic circuits using in vivo measurements of transcription factor binding energies". 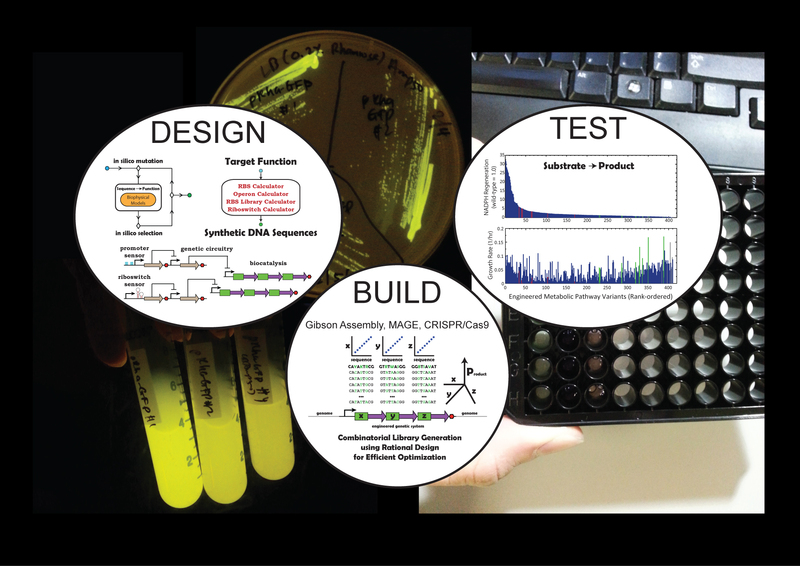 A New Grant to Design Sensors and Genetic Circuits! 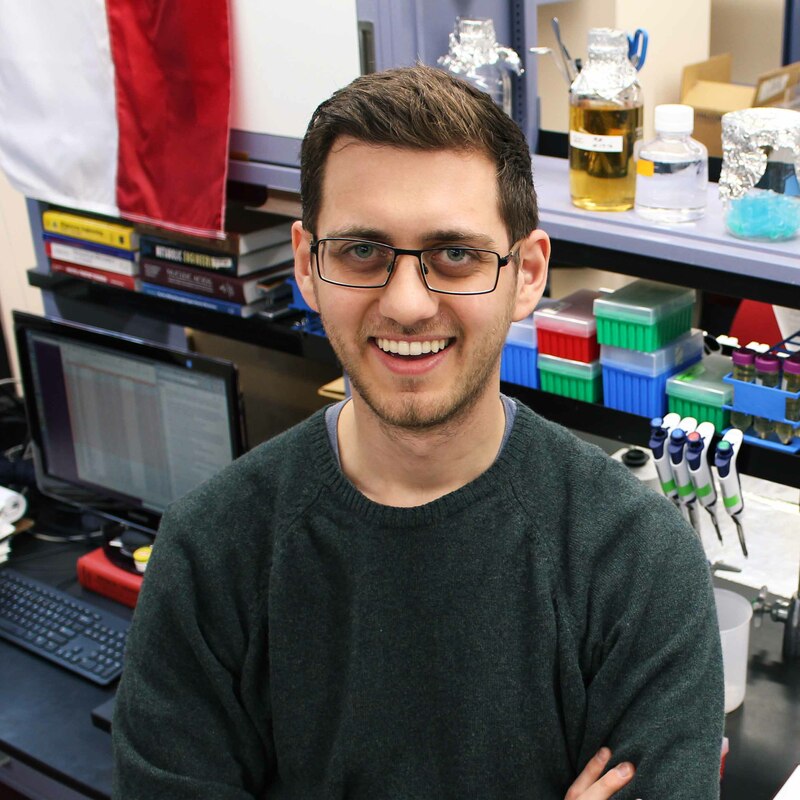 The Salis Lab receives a grant from the Office of Naval Research to engineer advanced cellular sensors and signal processing genetic circuits. 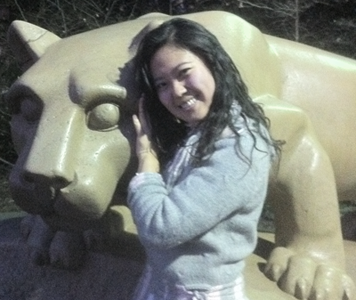 ChiamYu Ng Wins Penn State Award! Chiam Yu Ng wins the Best Candidacy Exam Award. Congratulations! Howard presents the lab's research results on the "Efficient Design and Optimization of Genetic Circuits and Metabolic Pathways" at the Society for Industrial Microbiology and Biotechnology in San Diego, CA. 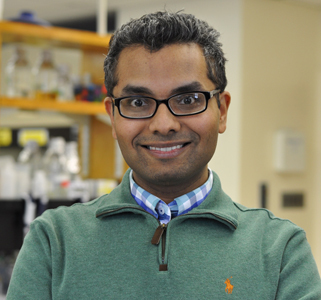 Howard receives the NSF Career Award to develop next-generation approaches for metabolic pathway engineering. Howard Salis presents an invited talk, "Clone Less, Know More: Efficient Design and Optimization of Genetic Circuits and Metabolic Pathways" at the International Workshop on Bio-design Automation in London. Long Chen Defends his Masters Thesis. Congratulations! 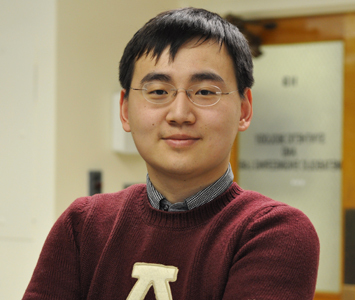 Long Chen successfully defends his Masters Thesis on a molecular lock and key system to control DNA replication. Congratulations! 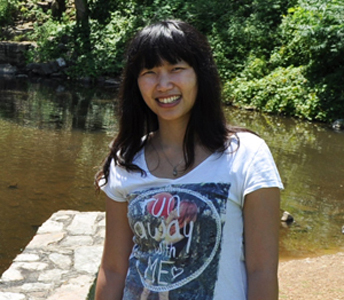 Chiam Yu Ng joins the Salis lab as a first-year Chemical Engineering graduate student. Welcome! Tian Tian Presents Her Work at SynBERC! Tian Tian presents her work on a "Biophysical Model of Translational Coupling to Coordinate Protein Expression" at the SynBERC Fall Retreat. A New Grant to Design Advanced Sensors and Genetic Circuits! 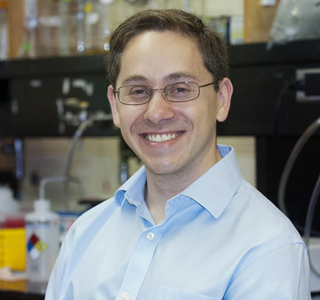 The Salis lab receives an ONR MURI grant to develop advanced cell-based sensors and signal processing genetic circuits. Tian Tian Defends her Masters Thesis. Congratulations! Tian Tian successfully defends her Masters Thesis on a new biophysical model of translational coupling, and will be continuing as a PhD student. Congratulations! 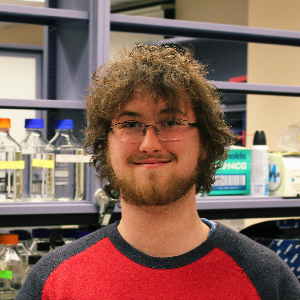 The Salis lab receives a DARPA grant to develop a genetic security system for recombinant DNA. A junior-level required course. The fundamentals of fluid mechanics, heat transfer, and mass transfer are applied to biological systems at scales ranging from microbial to ecological. This course includes a weekly 2-hour lab. Past lecture notes are available here. A junior/senior-level required course. Design principles for engineering biological systems are introduced, with a focus on biotechnology and pharmaceutical applications. This course covers the engineering of proteins, metabolism, and genetic circuits using kinetics, thermodynamics, bioinformatics, and genetic engineering techniques. A senior-level required course. Introduction to principles and applications of mass transfer with a focus on the design of equilibrium staged and continuously contacting separation processes. An undergraduate elective course. An introductory course on designing and modeling small genetic systems -- sensors, regulators, and enzymes -- that reprogram an organism's behavior towards making cellular decisions and manufacturing chemical products. BE 597 | ChE 597: Synthetic Biology. Programming Life. A graduate-level elective course. An in-depth course on designing and modeling synthetic genetic circuits to carry out Boolean decision-making, analog feedback control, and programmed decision-making. Several literature examples are discussed. Stochastic and deterministic modeling approaches are reviewed and applied to example systems. International Genetically Engineered Machine Contest (iGEM). 2010-present. NSF Research Experience for Undergraduates: Chemical Energy Storage and Conversion. 2010-2013. 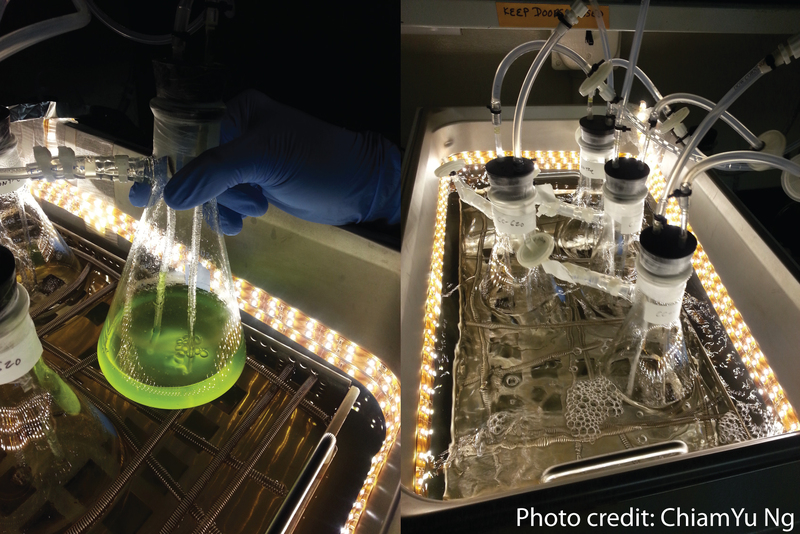 NSF Research Experience for Undergraduates: Biologically Inspired Catalytic Materials. 2014-present. We are currently recruiting graduate students from the Biological Engineering and Chemical Engineering departments. Please apply to their respective graduate programs, and contact Howard for more information on research topics.